I spent the day eating beef jerky in my new van. I’m only sort of kidding. If this is what freedom looks like, then hella I’m livin’ the dream. I won’t lie. I did some crying in there, too, but the much-needed release felt amazing. Grieving…with beef jerky. Being between homes is strange, though. Things I used to take for granted now feel like luxuries: hot showers, wifi, push-button coffee. (Though I must admit, French press coffee has been super easy to get used to.) This whole experience is making me more humble, more aware, more compassionate. But I know a lot of people are probably still wondering what on earth would compel me to choose an oversized box on wheels as a daily driver. Well, the truth is, this van solved several problems for me. First off, I needed a new car anyway, so the van ticked off the “reliable form of transportation” box on my to do list. Right now, I simply don’t have the mental or emotional capacity to deal with costly repairs while traversing the U.S. A new car just made more sense. Sure, Mercs are pricey, but that leads me to the second problem it solved: moving expenses. When I found out it was going to cost 7k+ to ship a few trinkets across the country, I laughed into the phone receiver. Seriously? No, wait. You’re being serious, aren’t you? That was money I would never ever ever ever get back. And I’m pretty sure I can replace a few pairs of socks and a handful hangers for less than 7k. See where I’m going with this? At least with the van, I could recover a good chunk of change if I ever decided to sell it. Plus, I was ready to downsize anyway, so it was a no-brainer. Third, it gave me a temporary housing solution. To be clear, I have no plans of becoming a full-time van dweller. Travel a little, yes. Live in a van down by the river, no. But since I still haven’t zeroed in on where to establish new roots yet, it’s a great in-between option. I can stay at wineries, campgrounds, Airbnbs, hotels, resorts, or with friends who have guest rooms (or neighbors that don’t mind a creepy van parked on the street). And the fourth problem it solved was that it bought me time. Now is not the time to rush a major life decision, like buying a house or signing a lease. Life is churning and tumultuous and chaotic, and I’m in the middle of grieving the biggest loss of my life. It’s a recipe for weirdo decisions. (Okay, you’re right. Maybe buying a giant rig is super weird.) But my point is, I need to breathe. I need to explore. I need to stay open so that whatever is meant to show up can show up. And that’s why I bought the van instead of a used Pinto. When we face these difficult life transitions, we have to understand ourselves well enough to know what we’re going to need to get through them. And the way we do that is to develop a self-care practice that fully supports us. Maybe it involves beef jerky; maybe it doesn’t. But we get to choose. Register for the 8-Day Self-Care Challenge here. This entry was posted in Self-Care News. Bookmark the permalink. 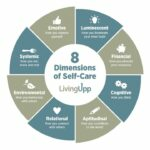 I'm Stacy Fisher, the founder of Living Upp, a lifestyle design company that teaches people how to use an 8-dimensional framework to experience better health, more balance, and greater joy. I'm a registered dietitian, author, and lifestyle coach with more than 19 years of experience in the healthcare industry, where I've worked with large companies such as Dell, Boeing, and Nike.